My work develops from the need to be heard, the unapologetic nature of honest work and self-examination. 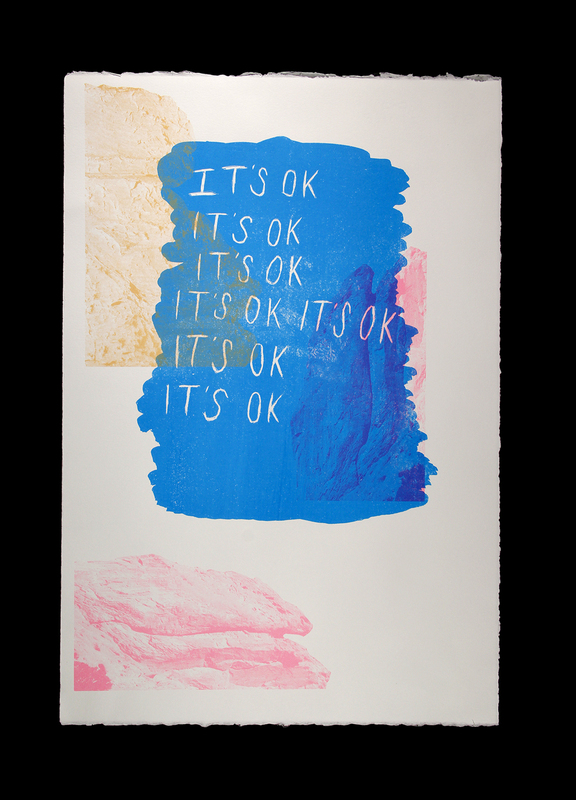 The work is constructed of facile writing and drawing, monoprints, screenprints, hoarding, and groupings. Using automatic drawing and staying open to process the work begins to carry an energy of it’s own. By using an honest process based in free association the viewer is able to be accepted into the work and feel the connection in a grounded way. Attaching half-baked thoughts, lists, and short phrases to quick, dreamlike imagery makes the work both allusive and relatable. By using repetition of images and language I create my own mantras within the work that are contradicting of the idea of mediation. Neurotically repeating “It’s OK. It’s OK. It’s OK.” suggests that things are not OK. My work does not try to figure anything out. Instead it explores a liminal space and the urgency that comes along with getting older and grappling with the past while confronting the future.